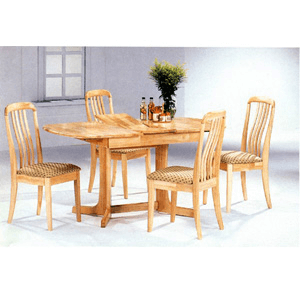 5-Pc Dinette Set. Butterfly Leaf Table With Double Pedestal Base Dining Table In Natural Finish (4363 (CO)). Size: 48-60L., 36W.. Natural High Back Dining Chair With Fabric Seat (4357 (CO)), Size: 16-1/4W., 18-1/2D., 36-1/4H.. Strong Construction. Easy To Assemble.